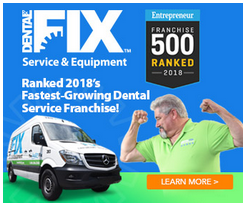 DAVIE, Fla. (March 1, 2019) – Dental Fix Rx, a fast-growing national mobile dental equipment repair franchise and subsidiary of Dental Whale, experienced strong demand for its Unlimited Service Plan (USP) in the San Diego market. Shane Ludlow, Dental Fix Rx franchisee and San Diego territory owner, enrolled seven new dental practices in the USP, just months after offering the popular new program within his territory. With the USP, dental practices receive regular preventive maintenance checks and repair services for one low monthly flat rate. Whether it’s a dental chair, compressor, ultrasonic scalers or anything else, a Dental Fix Rx technician will be there when dentists need them – and even before they are needed. Dental practices enrolled in the USP receive the same first-rate service every time because the same Dental Fix Rx technician performs all checks and repairs. The USP, provided by the leading mobile dental equipment repair company that serves more than 53,000 customers throughout North America, helps dentists remain productive and profitable. Ludlow opened his Dental Fix Rx franchise in September 2014, and has benefitted from a strong client base and impressive year-over-year growth. After rolling out the USP five months ago, Ludlow has expanded his territory’s footprint and regularly serves 500 dentists, who turn to Dental Fix Rx for their dental equipment repair and maintenance needs. Dental Fix Rx’s USP is rapidly fulfilling demand for cost-effective repairs in the dental industry. Ludlow’s climbing enrollment rate for the Dental Fix Rx service offering exemplifies the USP’s continuous momentum, which began soon after its system-wide launch in August, 2018. In the first 120 days since the program’s launch, 160 clients in franchise territories across the country signed on to participate in the plan, proving the vast industry demand for regular dental equipment repair and maintenance programs. Subscribers to the plan receive fast priority repair service, access to free loaner equipment when available, same-day emergency calls for compressors and vacuum pumps, and more. The goal of the USP program is to prevent equipment from breaking, which eliminates downtime and saves practices money.